Delicious Slow Cooker Peach Jam & only 3 ingredients! Take the heat out of jam making & let your Crockpot do all the work for you. I shouldn’t complain about the weather as I love all the sunshine and it means our produce is growing and ripening well but it’s been over 34℃ in our Kitchen Shed and for me, that’s a tad too warm. The jam making season has well and truly begun, with raspberry jam and josta berry jam already stashed in the pantry ready to remind us of summer when it’s cold and raining. I managed to get another bargain tray of peaches from the supermarket and just in case this might be our last bargain tray I wanted to make some peach jam. Although inspired by Joanne Harris’s description of Vianne making peach jam, the thought of me and a hot jam pan in over thirty odd degrees heat did little for my enthusiasm. Perfect solution: use my slow cooker. Making jam in the slow cooker is so easy as everything goes in the pot, you give it a couple of stirs and a few hours later you have a bright and tasty peach jam. I wanted a smooth jam so I whizzed it with a hand blender once the sugar had dissolved but you can omit this step if you prefer. Peaches are low in pectin, so added pectin is required to help the jam set. I like to use a packet of pectin (see photo) and sugar but you can buy ready mixed bags of jam sugar if you prefer. This jam is so delicious I’m not sure it’s going to make it to the pantry, we’ve already had some Slow Cooker Peach Jam with our homemade thick and creamy yoghurt. I feel a scone baking session is required – I’m drooling at the thought ! An easy way to sterilise jars is to pop clean jars in the microwave on full power for a couple of minutes. A couple of saucers or plates to check the jam has set. Place a couple of saucers or plates in the fridge ready to test your jam later. Add chopped peaches and lemon juice to the slow cooker pot and stir. Add sugar and pectin (or jam sugar) and stir. Pop on the lid and cook on low for one hour. Scrape down any sugar and replace the lid and cook on low for another hour. Stir your jam mixture and turn up your slow cooker to high – the sugar will have fully dissolved by now. Replace the slow cooker lid but this time prop it open a little with a wooden spoon to allow the steam to escape. Cook on high for 2 to 3 hours until set. Check after 2 hours: drop a small amount of jam on to your chilled saucer. Allow to cool for a couple of minutes and then push gently with your finger tip. If the jam crinkles, setting point has been reached. Mine did need the 3 hours but it very much depends on your slow cooker. Transfer to sterilised jars and screw on lids. Store in a cool dry place away from direct sunlight and once opened store in the fridge. The recipe works well with nectarines too. Credit Crunch Munch created by Helen and Camilla, hosted this month by Elizabeth over at Elizabeth’s Kitchen Diary. The Vegetable Palette, hosted and created by Shaheen over at Allotment 2 Kitchen. 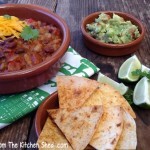 Ren Behan’s Simple and in Season hosted this month by Elizabeth at Elizabeth’s Kitchen Diary. Recipe Of the Week hosted and created by Emily over at A Mummy Too. 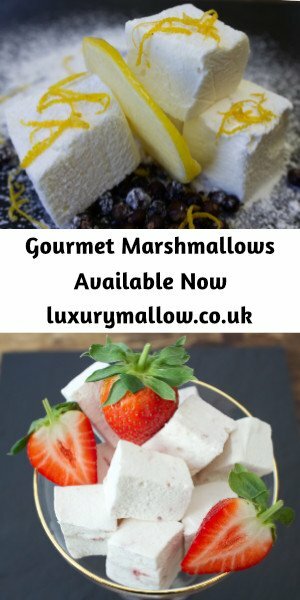 Lucy’s Cook Blog Share over at Super Golden Bakes. I love using my slow cooker for stuff like this. Every fall I make a few batches of apple butter in my slow cooker. I bet this is outstanding! Yum! I love how easy this is to put together. Such a great use of the slow cooker. I would love to pair the jam with yogurt. I didn’t know you could make jam in the slow cooker! Good luck in your recipe challenges! Thanks Danielle, I love using my slow cooker for preserving, it’s great for a chutney too. It’s time for making those jams! It’s something I’ve never done, but clearly need to get to it, especially now that it’s filled with delicious fruits at the farmer’s market. Farmers markets are a great place to get a bargain and making jam means you can preserve some fruit for the winter to remind us of all those summer fruits. The jam and homemade yogurt looks perfect for a quick breakfast! Thanks Julie, we usually have peach jam and yoghurt as a dessert but what a good idea for a quick breakfast. I have never made jam in the slow cooker. What a great idea. I just bought some peaches today..and cherries. Maybe I have to give this a try. Thanks Gloria, the slow cooker really does make an easy job of jam making, hope you do get to try making some. I love making jam, but I’ve never tried it in the crock pot! That’s a brilliant idea, and I’m going to try it straight away! Thanks Jenny, do let me know how you get on. Ive not tried slow cooker jam so shall definitely give it a try does it keep as well as conventionally made jam.? Lovely to see your jam on Instagram Jacqui. It keeps for up to a year unopened much like conventionally made jam, I think it depends on the set. I tend to give the jam its full time in the slow cooker. I have found that once it’s opened, it’s best kept in the fridge unlike some conventionally made jams. So happy I found this. I just bought 20 pounds of peaches. I’ve made Apple Butter in a slow cooker but not jam. So I am looking forward to making scads of home made Peach jam. Yum! Just found this!! I imagine that finding a glut of ripe peaches is much easier in France than it is in the UK, but this jam sound wonderful. Could you also make apricot jam in the same way and would the apricots need stoning first (thinking about what’s IN the stones!) Also, what size slow cooker did you use? I have two, one is a large family sized one and the other the smallest you can get, just for two people. Thanks Mary, glad you found my blog. Apricots would work very well, I must admit I’ve always stoned my fruit but I shouldn’t think there would be a problem cooking the jam with the stones in the fruit. 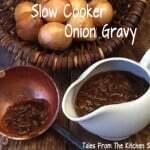 Your family sized slow cooker sounds the best size, I used a slow cooker with a 3.5 litre ( 4 Quart ) capacity. thanks so much we just googled slow cooker peach jam and yours was the first recipe thank you. i have soooo much fruit this year iv’e doubled the amount so i hope it works out maybe a little longer to cook can you advise ?? I love the idea of this. Perfect for when you wat to make jam, but it is too hot, or if you do not want to stand and watch it. I’ve just come into a windfall of peaches so this is perfect. As DELICIOUS as jam on toast is, I’m particularly partial to a generous amount of jam with yoghurt like you pictured above…. Thanks Rachel, how lucky to have a windfall of peaches. 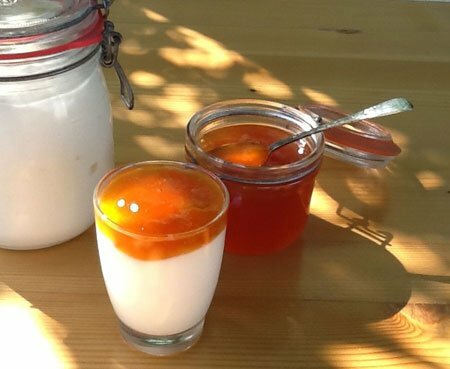 Peach jam is delicious with yoghurt, especially thick and creamy homemade yoghurt. Ooh wow, peach jam is a real taste of summer and not something I’ve ever eaten in this country, let alone made. Did you bake those scones? 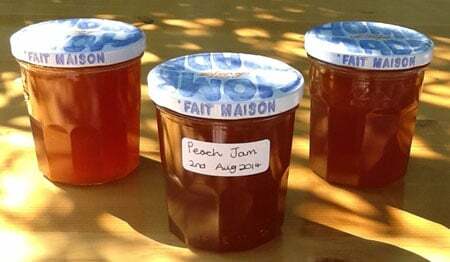 Having recently made some peach jam myself using a different method it is really interesting to read about your version. I’ve never made jam in my slow cooker but it sounds so much easier and something I would like to try now if I can get hold of enough fruit to make it worthwhile. Thank you so much for sharing with #VegetablePalette. Your slow cooker peach jam is stunning and beaming with delicious edible spreadable gold. I’ve only ever made Apple Butter in a slow cooker, I love the ease of this recipe and hope to use my slow cooker once again. 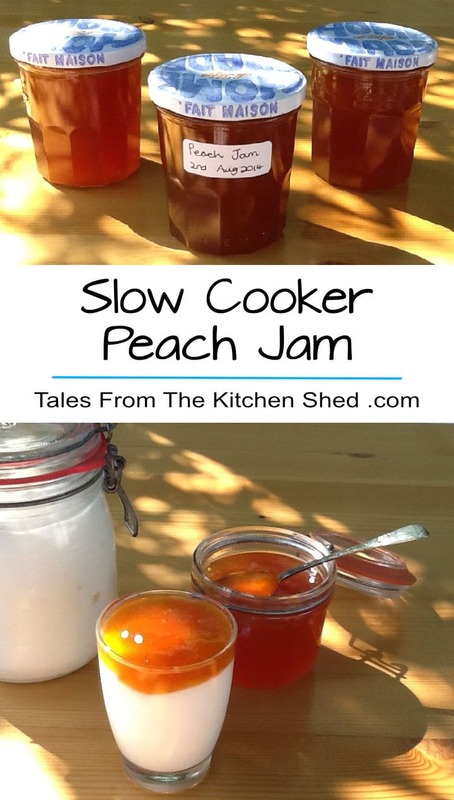 Thanks Lucy & thank you for featuring my peach jam recipe on #CookBlogShare. Wow…another great use for the slow cooker, genius! Thanks Laura, look forward to hearing how you get on. The pleasure of making jam from the abundant fruit around at the moment can be dimmed by the thought of the hot pan so I’m all for using the slow cooker. Sounds like an excellent notion to me, especially since I’ve never tried making peach jam before. Thanks Phil, making jam in the slow cooker does make an easy job of it and peach jam is so delicious I recommend you trying it. 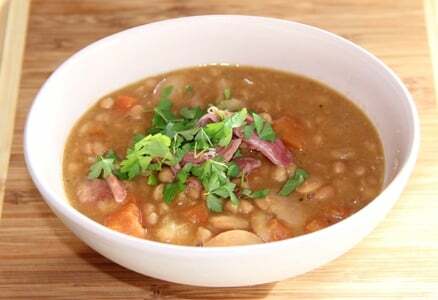 That looks so good, I need to get myself a slow cooker now! I love compote with yoghurt and yours looks so tasty. Thank you. I’ve seen some bargain prices this year for slow cookers and once you’ve tried it, you’ll be using it all the time, well worth buying! Having recently discovered the joys of slow cooking, I have been searching around for some more recipes to try, and this one looks perfect! I’ve never made jam before, but this has inspired me to give it go, thank you! Thanks Hellie for popping over from #recipeoftheweek & I’m pleased you like the Slow Cooker Peach jam. Hoping to take a look at this week’s recipes myself later. You’re welcome Elizabeth, happy to share with Simple & in Season as well as Credit Crunch Munch. The slow cooker really comes into its own in a hot summer kitchen & I was pleased not to lose any of the peach colour. That sounds so good, Sarah. I am so excited to see what everyone makes in this preserve challenge and its good to have an expert to start us off. Thanks for joining me in the Slow Cooker Challenge. Thanks Janice, it’s a pleasure to link up with your Slow Cooker Challenge, it’s the perfect theme for this time of year. I’m looking forward to seeing everyone’s entries too.